Hiring? Toptal handpicks top Swift developers to suit your needs. Nilson (dual BCS/BScTech) been an iOS dev and 2D/3D artist for 8+ years, focusing on physics and vehicle simulations, games, and graphics. Coming from an Objective-C background, in the beginning, I felt like Swift was holding me back. Swift was not allowing me to make progress because of its strongly typed nature, which used to be infuriating at times. Unlike Objective-C, Swift enforces many requirements at the compile time. Things that are relaxed in Objective-C, such as the id type and implicit conversions, are not a thing in Swift. Even if you have an Int and a Double, and you want to add them up, you will have to convert them to a single type explicitly. Also, optionals are a fundamental part of the language, and even though they are a simple concept, it takes some time to get used to them. In the beginning, you might want to force unwrap everything, but that will eventually lead to crashes. As you get acquainted with the language, you start to love how you hardly have runtime errors since many mistakes are caught at compile time. Most Swift programmers have significant previous experience with Objective-C, which, among other things, might lead them to write Swift code using the same practices they are familiar with in other languages. And that can cause some bad mistakes. 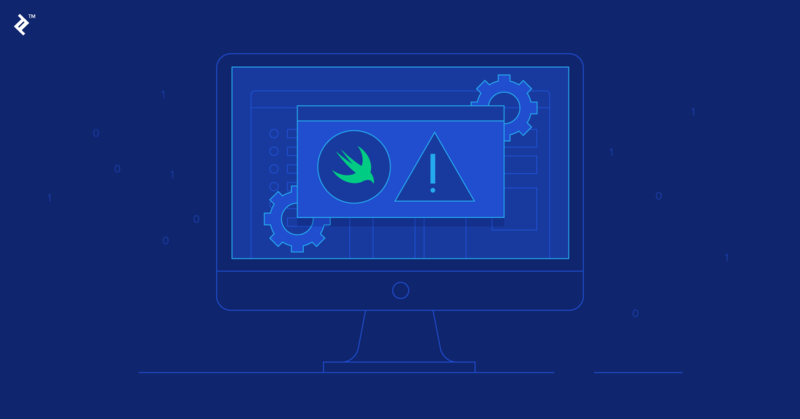 In this article, we outline the most common mistakes that Swift developers make and ways to avoid them. Make no mistake - Objective-C best practices are not Swift best practices. A variable of an optional type (e.g. String?) might or might not hold a value. When they don’t hold a value, they’re equal to nil. To obtain the value of an optional, first you have to unwrap them, and that can be made in two different ways. Second is forcing unwrap using the ! operator, or using an implicitly unwrapped optional type (e.g. String!). If the optional is nil, forcing an unwrap will cause a runtime error and terminate the application. Further, attempting to access the value of an implicitly unwrapped optional will cause the same. We sometimes have variables that we can’t (or don’t want to) initialize in the class/struct initializer. Thus, we have to declare them as optionals. In some cases, we assume they won’t be nil in certain parts of our code, so we force unwrap them or declare them as implicitly unwrapped optionals because that’s easier than having to do optional binding all the time. This should be done with care. This is similar to working with IBOutlets, which are variables that reference an object in a nib or storyboard. They won’t be initialized upon the parent object’s initialization (usually a view controller or custom UIView), but we can be sure they won’t be nil when viewDidLoad (in a view controller) or awakeFromNib (in a view) is called, and so we can access them safely. In general, the best practice is to avoid forcing unwrap and using implicitly unwrapped optionals. Always consider the optional could be nil and handle it appropriately either using optional binding, or checking if it’s not nil before forcing an unwrap, or accessing the variable in case of an implicitly unwrapped optional. A strong reference cycle exists when a pair of objects keeps a strong reference to each other. This is not something new to Swift, since Objective-C has the same issue, and seasoned Objective-C developers are expected to properly manage this. It’s important to pay attention to strong references and what references what. The Swift documentation has a section dedicated to this topic. It’s particularly important to manage your references when using closures. By default, closures (or blocks), keep a strong reference to every object that is referenced inside of them. If any of these objects has a strong reference to the closure itself, we have a strong reference cycle. It’s necessary to make use of capture lists to properly manage how your references are captured. If there’s the possibility that the instance captured by the block will be deallocated before the block gets called, you have to capture it as a weak reference, which will be optional since it can be nil. Now, if you’re sure the captured instance will not be deallocated during the lifetime of the block, you can capture it as an unowned reference. The advantage of using unowned instead of weak is that the reference won’t be an optional and you can use the value directly without the need to unwrap it. In the following example, which you can run in the Xcode Playground, the Container class has an array and an optional closure that is invoked whenever its array changes (it uses property observers to do so). The Whatever class has a Container instance, and in its initializer, it assigns a closure to arrayDidChange and this closure references self, thus creating a strong relationship between the Whatever instance and the closure. var arrayDidChange: ((array: [T]) -> Void)? In this case, we can use unowned, because self will never be nil during the lifetime of the closure. It’s a good practice to nearly always use capture lists to avoid reference cycles, which will reduce memory leaks, and a safer code in the end. Unlike in Objective-C, with Swift, we are not required to use self to access a class’ or struct’s properties inside a method. We are only required to do so in a closure because it needs to capture self. Using self where it’s not required is not exactly a mistake, it works just fine, and there will be no errors and no warnings. However, why write more code than you have to? Also, it is important to keep your code consistent. Swift uses value types and reference types. Moreover, instances of a value type exhibit a slightly different behavior of instances of reference types. Not knowing what category each of your instances fit in will cause false expectations on the behavior of the code. In the most object oriented languages, when we create an instance of a class and pass it around to other instances and as an argument to methods, we expect this instance to be the same everywhere. That means any change to it will be reflected everywhere, because in fact, what we have are just a bunch of references to the exact same data. Objects that exhibit this behavior are reference types, and in Swift, all types declared as class are reference types. Next, we have value types which are declared using struct or enum. Value types are copied when they’re assigned to a variable or passed as an argument to a function or method. If you change something in the copied instance, the original one will not be modified. Value types are immutable. If you assign a new value to a property of an instance of a value type, such as CGPoint or CGSize, a new instance is created with the changes. That’s why we can use property observers on an array (as in the example above in the Container class) to notify us of changes. What’s actually happening, is that a new array is created with the changes; it is assigned to the property, and then didSet gets invoked. Thus, if you don’t know the object you’re dealing with is of a reference or value type, your expectations about what your code is going to do, might be entirely wrong. When we talk about enums, we generally think of the basic C enum, which is just a list of related constants that are integers underneath. In Swift, enums are way more powerful. For example, you can attach a value to each enumeration case. Enums also have methods and read-only/computed properties that can be used to enrich each case with more information and details. The official documentation on enums is very intuitive, and the error handling documentation presents a few use cases for enums’ extra power in Swift. Also, check out following extensive exploration of enums in Swift to learn pretty much everything you can do with them. The Swift Standard Library provides many methods that are fundamental in functional programming and allow us to do a lot with just one line of code, such as map, reduce, and filter, among others. The map will output an array of CGFloat, containing the height of each cell, and the reduce will add them up. We have to be careful, though, because you might be tempted to chain a couple of calls to these methods to create fancy filtering and transforming, which may end up with one line of unreadable spaghetti code. func intersect(shape: Shape) -> Shape? The statement where Generator.Element: Shape is a constraint that states the methods in the extension will only be available in instances of types that conform to CollectionType, which contains elements of types that conform to Shape. For example, these methods can be invoked on an instance of Array<Shape>, but not on an instance of Array<String>. If we have a class Polygon that conforms to the Shape protocol, then those methods will be available for an instance of Array<Polygon> as well. With protocol extensions, you can give a default implementation to methods declared in the protocol, which will then be available in all types that conform to that protocol without having to make any changes to those types (classes, structs or enums). This is done extensively throughout the Swift Standard Library, for example, the mapand reduce are defined in an extension of CollectionType, and this same implementation is shared by types such as Array and Dictionary without any extra code. This behavior is similar to mixins from other languages, such as Ruby or Python. By simply conforming to a protocol with default method implementations, you add functionality to your type. Protocol oriented programming might look quite awkward and not very useful at first sight, which could make you ignore it and not even give it a shot. This post gives a good grasp of using protocol-oriented programming in real applications. Swift was initially received with a lot of skepticism; people seemed to think that Apple was going to replace Objective-C with a toy language for kids or with something for non-programmers. However, Swift has proven to be a serious and powerful language that makes programming very pleasant. Since it is strongly typed, it is hard to make mistakes, and as such, it’s difficult to list mistakes you can make with the language. When you get used to Swift and go back to Objective-C, you will notice the difference. You’ll miss nice features Swift offers and will have to write tedious code in Objective-C to achieve the same effect. Other times, you’ll face runtime errors that Swift would have caught during compilation. It is a great upgrade for Apple programmers, and there’s still a lot more to come as the language matures. Great Post, thanks for helping us to be a better developers. Swift is a powerful language and know how to use properly open a new universe for the developers. Kudos! Awesome post. I have yet to get seriously into Swift, but this post was still incredibly accessible. Loved the bit about optionals. I've been scratching my head about those a bit -- this make them a lot more clear. Thanks! Interesting article for beginners. I would disagree with not using `self` everywhere. Being able to tell if the property is defined in the class or in a method scope is actually valuable. It removes the need to read previous parts of the code and therefore avoids unnecessary confusions! Good article! How big are your methods that you can't see if something is defined right there or in the param list? If they're bigger than a screen size, they're too big. It's definitely not confusing if you leave it out. Use self when the compiler tells you that you need to (i.e disambiguation of a local var with same name, or referencing self within a closure).... otherwise leave it out - it just makes the code harder to read. It's such an Objective-C habit that needs to be dropped. Good list. I've seen the same problems, and I agree with all of them. Haha no my methods are not a screen size long, thanks for your concern. I guess that is more about taste and quite subjective, we will probably never agree... Indeed, definitely way too many years of Objective-C.
Another reason for using "self." is when you want to move lines of code to a closure. In this example you don't need to add "self" to each line. With today's modern IDEs we have nice and colorful syntax highlighting which helps with distinguishing among these without the need to write more code. How often that needs to be done? Very rarely I am afraid. Not really a good excuse to use the unnecessary `self.` everywhere. Swift is a well known and widely used programming language. Mistakes are a part of the human behavior and is natural to happen. So thanks a lot for sharing that part with swift and making us aware about it.